I feel like I should quote a Beatles' song to describe most of our trip this spring... you know the one that goes..."the.. long.. and.. winding road...♫ da-da-da." That's because we did a whole lot of driving in the month we were in France, and a lot of the driving we did was on roads like this. Winding and narrow, with spectacular scenery. 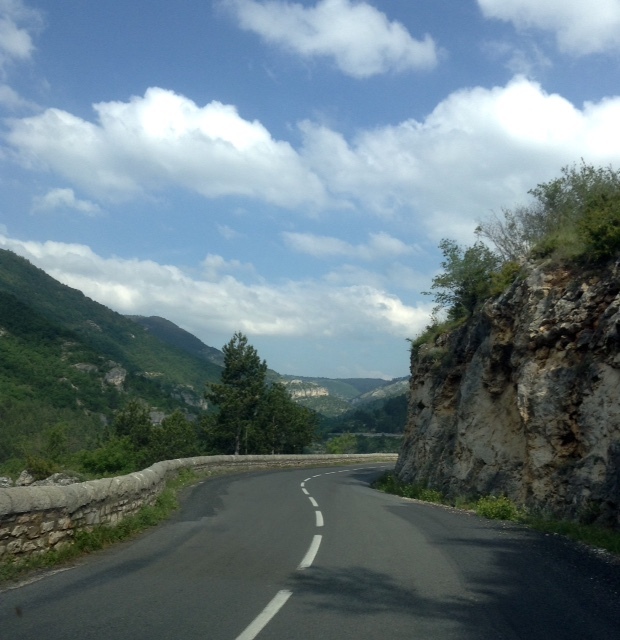 The day we left Ispagnac in Languedoc, to drive through the Gorges du Tarn was no exception. The road snaked along the banks of the river Tarn, winding between stone fences and, eventually, steep drop-offs on one side and soaring cliffs on the other side. And in several places right through the cliffs. Requiring some serious driver concentration. We've driven lots and lots of small roads before, in the Yukon, New Zealand, Scotland, Ireland, and Hubby's an intrepid driver. I remember our very first time on roads like this on the north island of New Zealand. We often encountered a speeding car driven by a local who would be perfectly happy occupying the middle of the road until the last possible second, and then would veer over to his own side and fly past in a rush of wind. And every time, Hubby would instinctively turn the wheel towards the edge of the road.... and I would gasp as I stared down into a ravine, the tires catching gravel on the shoulder before he righted the wheel and we both breathed again. He became much more comfortable as the trip wore on, but he'd still flinch ever so slightly as cars passed much too close for comfort. And we began to call it the "Kiwi Flinch," and then in Ireland and Scotland the "Celtic Flinch." 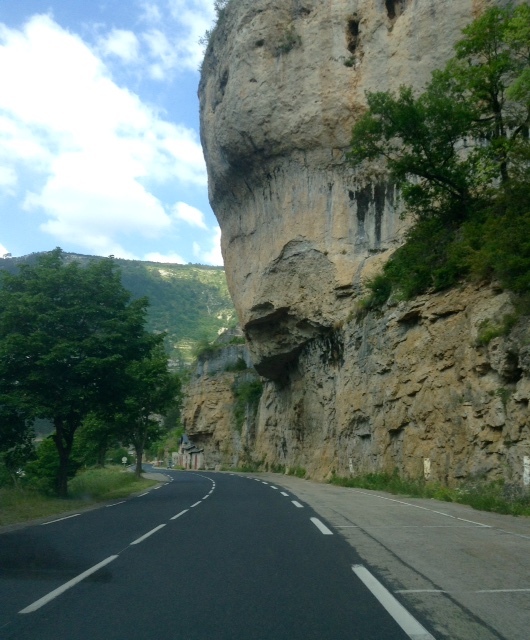 But I can honestly say that despite the fact that we'd driven some pretty hairy roads this trip, there was no "Gallic Flinch" until we drove the Gorges du Tarn. And then only a couple of times when the combination of cliff falling away on one side and cliff rising on the other side was compounded by the rising cliff presenting us with a gigantic-looking bulge, just when the road was at its narrowest point, and it looked as if the car would never be able to squeeze through. The road snaked up, up, up from the bottom of the gorge until we were looking down from almost the full height of the cliffs. This is a view down into the gorge. You can just make out the blue kayaks on the river. And the stone houses on the rocks at the base of the cliff and even built into the hillside above. Sometimes it was hard to tell the difference between cliff and house. The sun was so bright that day, it was hard to get a shot that captured how lovely this view was. 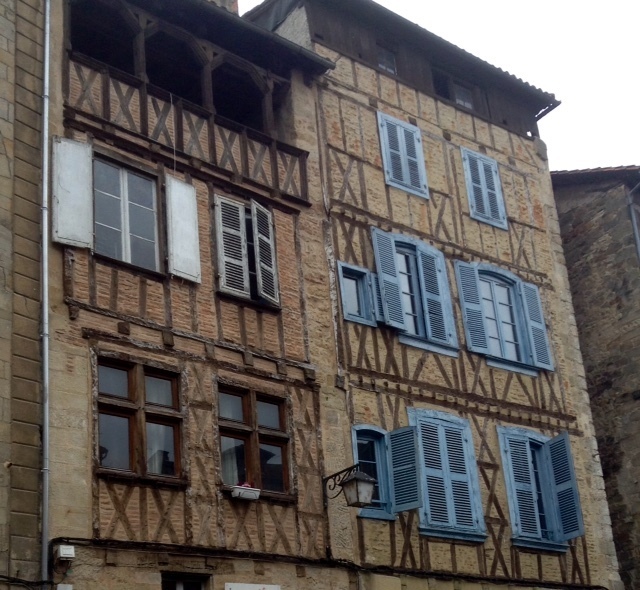 Later that day, tired and eye-strained we pulled into the town of Figeac. We'd never heard of Figeac until we'd booked into a Chambres d'Hôte here, but it has a long history, tracing its roots back to medieval times when it was a bustling commercial centre. I loved the narrrow streets and half-timbered houses in the old part of town. Almost expected Juliet to appear on that upper terrace. These buildings would have been around in Shakespeare's day, that's for sure. But alas for us, narrow one-way streets were not to the taste of our fair GPS maiden. And she lead us on a merry (okay...maybe cranky might be a better word than merry) dance before we stumbled upon our accommodation. But it was worth the hassle. Old and rambling and a bit in need of some upgrading, with a genial, helpful host, "Les Pratges" was our kind of place. 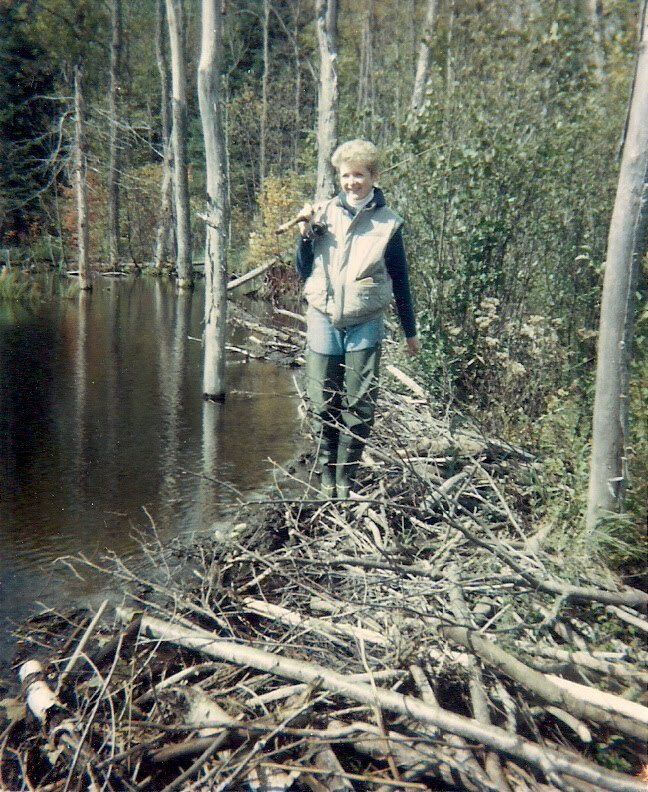 I loved that, when the proprietor, Gerard, asked me my name, he smiled gravely and said "Ah yes, a Canadian Suzanne. Like the Leonard Cohen song. Reminds me of my youth." And then we heard him humming the song as he worked in the kitchen. We walked along the river and into the old town for dinner that night. And then headed north enroute to the Loire Valley the next day. We watched the landscape quickly change as we drove north. Still beautiful, but different. The morning of my birthday, we stopped at this village. I can't remember its name. It was market day and we strolled past the stalls and purchased some excellent cheese, a couple of saucisses (I was becoming addicted to these ugly things) and, in a boulangerie, a baguette and several macarons. "Pour ma fête," I smiled and said to the cashier. "But in French class we always sang "Bonne Fête" to students who were having a birthday," I explained to a quizzical Hubby. Who knew that fête meant feast and not birthday? Ah well, it still applied though. We would have a feast that night. Below is a picture of the château in that little town. It seemed every town had its château. We heard classical music as we walked into the empty courtyard, and then saw the tiny speakers. That was pretty cool. But even if we had had time to take a tour, the gates were closed and locked. It was lunchtime after all, and this was Monday, and it was France. Or as our host in Arras shrugged and said ruefully when we asked why the stores were closed on Monday..."You are en France." Below is a shot of our B&B La Source de Bury in Chambon-sur-Cisse, near Blois. Here we would celebrate my birthday. On the night of our arrival with an al fresco supper of barbequed salmon and salad. Barbeque and charcoal kindly supplied by David our host, supper cooked to perfection by Hubby. Wine from our Chateauneuf du Pape adventure the previous week. Macarons for dessert. The next night we had my official birthday dinner at a local restaurant recommended by David. But I think I actually enjoyed lolling in these chairs, listening to the stream bubble over the rocks, sipping my Chateauneuf du Pape even more than the restaurant meal, lovely though it was. These are the gates we drove through to get to David's B&B. They are the vestiges of the old wall that once surrounded the nearby château. See, every village does have its own château. Or maybe it's more correct to say that every château had its own village. From our B&B each morning, after a wonderful breakfast of David's homemade breads, yogurt, confitures (rhubarb and fig being my favourite) and crepes, we set off to explore some of the more famous châteaux in the Loire Valley. Like the iconic Château Chenonceau. This is one I had seen in so many pictures, its reflection gleaming in the waters of the River Cher. 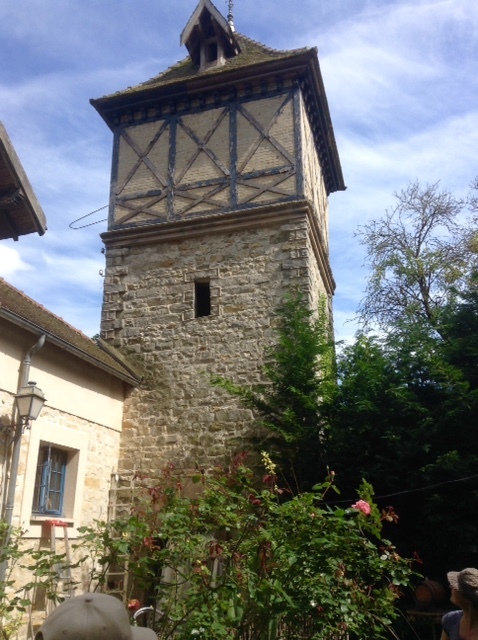 It was built on the foundations of an old mill. The next day we visited Château Chambord. Everyone we asked agreed we must see Chambord. The French Renaissance architecture was fabulous. But the château was so huge, we never felt that we had a sense of it as a whole. And it seemed impossible to capture it in a single photograph. But we climbed the famous double helix stairway inside and emerged onto the top outside walkway, up among the slanting roofs and towers and beautifully ornate spires. That was pretty amazing. Apparently Henry James said the "roofscape" of Chambord looked more like the spires of a city than of a single building. When we found our way out of the château, we explored the farm and gardens, and we met this little fellow. It seems to be my trip for meeting friendly donkeys. After Chambord, wonderful as it was, we had had our fill of the grand and the ornate. We were as Hubby said "château-ed out." We're actually more fond of the small and quirky. Like the field of sculptures in the tiny village of Chambon, created from old bicycle parts, bits of scrap metal, whatever came to hand, by students who live at the local "Le Foyer Amitié." According to a staff member with whom we chatted, these kids, who have no families, and who come from all over Europe, live in the "foyer" or what we, in Canada, would call a group home. They study to be artists and artisans. We thought the sculptures were wonderful. This is Hubby demonstrating his wolf call. Life imitating art? We had one more night on the road after we left Chambon sur Cisse. And we spent it here. In a B&B Inn called "La Marlotte" in Bourron-Marlotte near Fontainbleau. It's a converted stables. And it had everything my quirky-loving heart could desire. Charming, and unique, inside and out, filled with antiques and collectibles, I could have moved right in. There was even a pony and a horse stabled out back. In fact, when we checked in, the owner was just returning from her daily ride. Oh... and they had a cat. I love a place that has a cat. On top of that the dinner was really good, and the breakfast as well. Sigh. We were sad to leave. But leave we must. We had a car to return, once we navigated our way back to Paris CDG airport. And a flight home to catch. So that's it friends. Four weeks on the road, seven travel posts, and one fashion post. And I'm done with France. We met some wonderful people, saw some amazing places, climbed some really high mountains, got lost too many times to count, spoke some really bad French, ate way too many croissants, and stored up some wonderful stories. You ain't heard them all yet, you know. But for now.... it's late and I really should wrap-up this marathon post. I mean that's if there's anybody other than my mum still reading. Time for bed. Night, Mum. 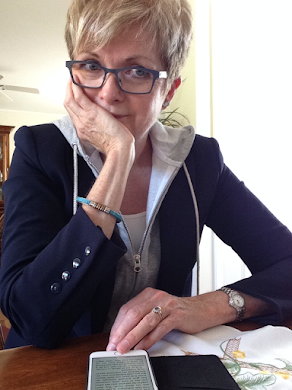 Linking up with Thursday Blog Hop at Over 50, Feeling 40. I loved your tour of France. I enjoy you're writing so much. Aren't travel memories the best? Thank you Clarice. Travel memories ARE the best. I do love the Loire valley. The castles are unbelievable (to an American like me), and the cottages are so charming. great photos and narrative. Thanks Suz. The châteaux are stunning. But I still love cottages the best. Well , you've shown us there's a lot more to France than Paris & quite right too . It's been great for me as I prefer countryside & villages to big cities . 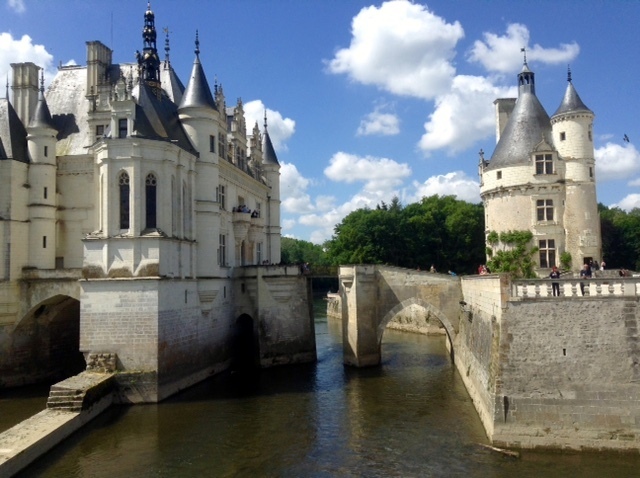 I wondered how you would feel about the Loire chateaux & I have to agree , small & quirky every time . It isn't my favorite area of France , though unique in its own way . I have really looked forward to these posts with your excellent photographs & great comments . Thank you for all the work you have put in . Thanks so much Wendy. I guess you know me pretty well (even if only through my blog) .... 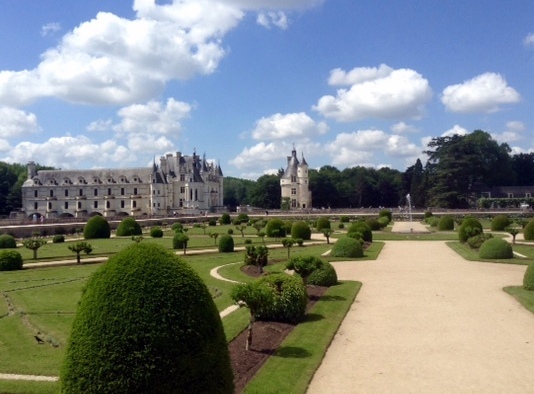 I thought the Loire Châteaux were amazing, but ultimately not my thing either. You covered so much of France, but you managed to really sink in and capture the spirit of a number of places. As I mentioned before to you, we had a very memorable meal in Blois some 25 years ago, but the meal we remember most from that trip is, like yours, a much more casual one: a picnic we had on the lawn at Chenonceau or Chambord, the most delicious rotisserie chicken, bought at a roadside stand, its flavour chased by us over the following decades, never matched. , . 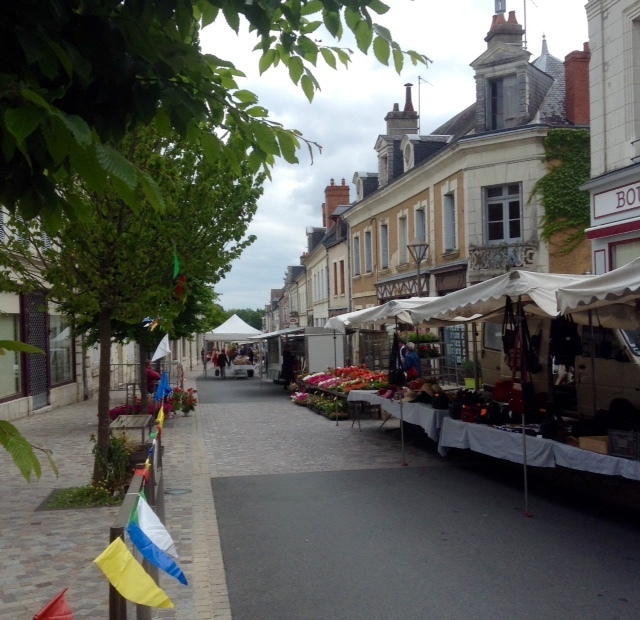 We had a day in Figeac the year before last --it has a really great market! Isn't Figeac lovely? I know you have been to France many times...I wonder what YOUR favourite place is??? Thoroughly enjoyed your trip! I'm heading out soon for three weeks--Scandinavia and England. Haven't yet rented a place abroad but it's on my list. Thanks for taking the time to write and post pics--I love taking a quick blog visit vacation before my real vacation! Thanks, Kim. Hope your trip is as enjoyable as ours was. Scandinavia is on our list of places we'd love to go... one day. Such an adventure! I too have been to Figeac - I think. I think we had lunch there once;). I have to ask, what was your favorite part of the trip, in retrospect? Hmmmm. Stu and I have been discussing this, as we are wont to do after a long trip. And I think I would have to say the three days in Languedoc. 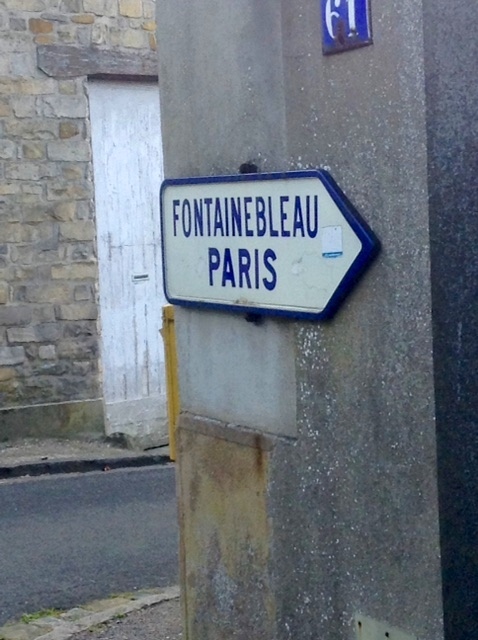 Paris and the Loire and Avignon were all amazing...but I really do prefer small, uncrowded, and even unheralded. Susan, this would be such a lovely addition to the upcoming month of posting Paris in July ! 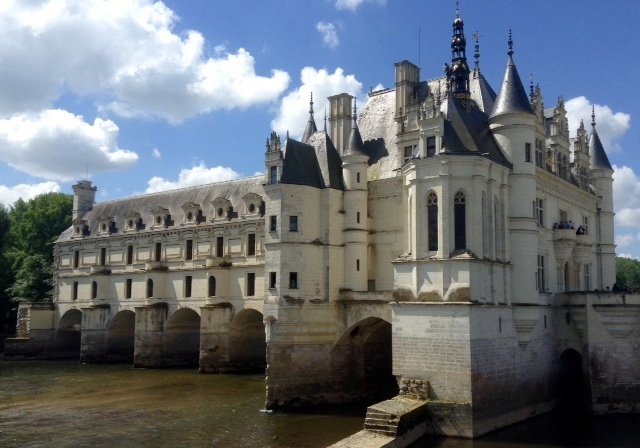 I have always wanted to see chateau chambord and chenonceau. Seems like such pretty places to visit. I recently got back from Paris but find myself dreaming of the countryside, looks like you had fun!